Google Talk was never a favorite to the advanced users and Enterprise users, here is how Google changed the way of usage and converted it to Google Chat. In our previous article, Google™s Cloud Computing and Branding Strategies in 2013; we wrote about Google’s new set of strategies. Google Talk is such a Cloud Based Application that was never in favorable situation. Reasons were various – presence of Yahoo! Chat, Skype, Windows Live Messenger etc. Google had a different strategy for Google Cloud since 2007, there is no Google Talk software for OS X or Linux. In fact Mac users used to fight to find out the way to use Google Talk using default Messages (formerly iChat) application. Right now the Video and voice plug-in for OS X is available both for PC and OS X – with OS X having more features; but it is actually for Chat within Gmail, iGoogle, and orkut. Google Talk was developed as an instant messaging client which uses the VoIP protocol XMPP (like Skype ) developed by Google. 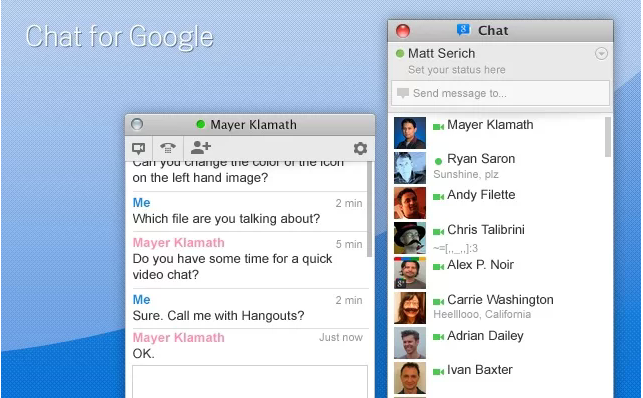 The beta version of Google Talk was released on August 24 of 2005 and both Mac OS X and Windows had official software. Google Talk is based on the interoperability protocol Jabber / XMPP, being configurable in programs such as Psi , Miranda IM , Messages (formerly iChat) and more third party softwares. A client can connect using XMPP which requires encryption with TLS and authentication over port 5222. Technically it is far superior to any chat server. “Google has started blocking invites sent from non-Google Jabber servers” was a ripple. But why Google gradually started to change the strategies of promotion of Google Talk remained unclear to the most. Most not noticed many points. Google is in the phase of unifying their hundreds of offers, free softwares or services towards their own infrastructure – towards Google Cloud. “You will need Google Chrome to install most apps, extensions and themes. Download Google Chrome.” Chrome is a browser which can make Google get a control over the user. Whether Google’s Chrome is superior to Opera, Safari or Mozilla FireFox is not the question, the answer of this motive is to gradually move the users towards Google Plus Hangouts, Chats and YouTube – a World that Google has virtually no competitors. Developing and distributing a software package, specially for OS X is a risk if you want to run a spying action. OS X packages can easily be unpacked to examine directly unlike Windows exe files which are practically a dead end of software development. Furthermore when a plugin works via API or a protocol on browser, the Operating System actually loss the control over the application unlike an installed software. Other than converting existing other browser users to Chrome users, which is useful for Google to track the user’s activity, it actually helps Google to promote their other paid services in some way of the other. This Article Has Been Shared 6510 Times! Cite this article as: Abhishek Ghosh, "Google Talk : Why Google is Interested About Native Cloud App," in The Customize Windows, May 5, 2013, April 21, 2019, https://thecustomizewindows.com/2013/05/google-talk-why-google-is-interested-about-native-cloud-app/.